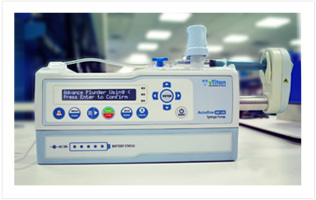 AccuFlow IBP-550 Syringe Pump is intended to be used in critical care areas to provide intermittnet or continuous flow of syringe infusion therapy to patients. While the infusion is in progress, Editing option is available to modify the programmed Infusion parameters. There are two modes of Programming, Normal and Emergency mode. Emergecy mode helps in starting an infusion instantaneously.